September is a month of transition in the garden with summer blooms waning and annuals spent from the summer heat. . .just like me :). While I’m biding my time for the mums, pansies and pumpkins to arrive in garden centers, I’ve been enjoying some late bloomers lately that have provided some entertainment as well as unexpected fall color! 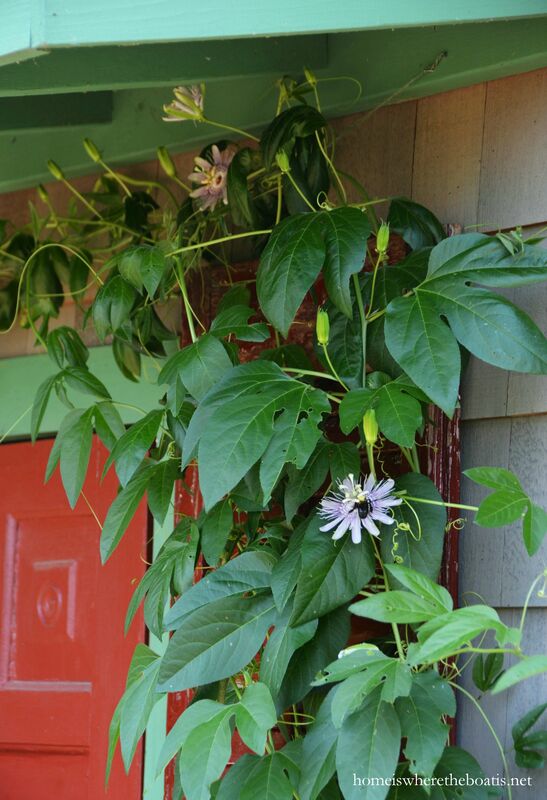 When my Passion Flower Vine volunteered and pushed its way up between cracks of the boards of the porch of my Potting Shed, I was anxiously awaiting the blooms it would bring this summer. 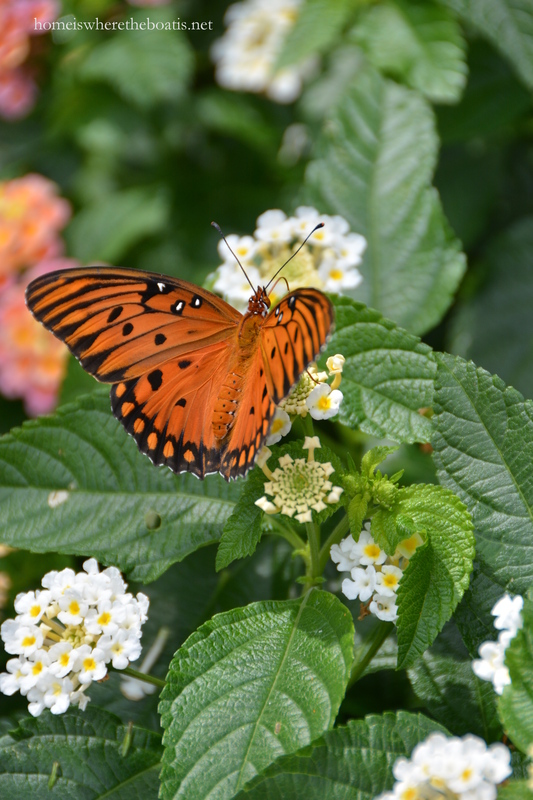 While I knew the blooms would attract pollinators, I had no idea that the foliage would be a food source for the Gulf fritillary butterfly. 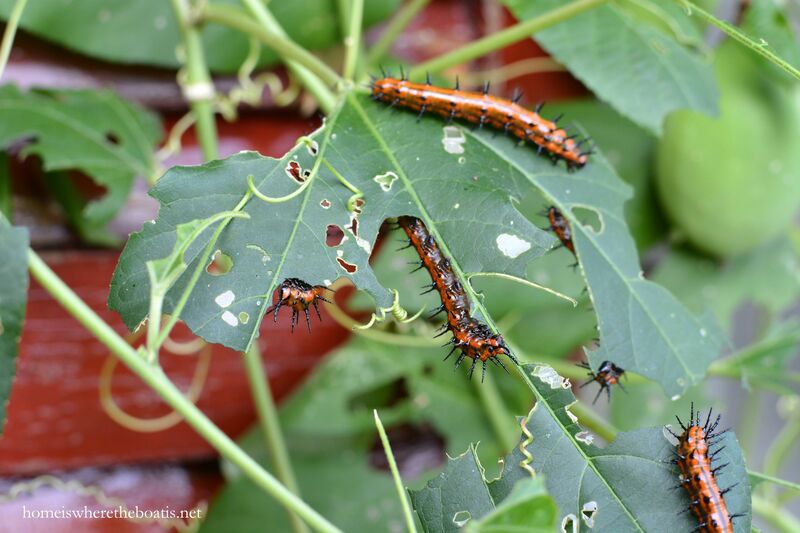 The larvae of the Gulf fritillary feed exclusively on species of passionflower. The caterpillars have rows of black spines that are soft to the touch and non-stinging, but protect them from predators along with their bright orange color~ a warning that they’re toxic if eaten. And they themselves have a voracious appetite! They stripped the vine of leaves in about 10 days. . . But it’s a small price to pay for these winged beauties! 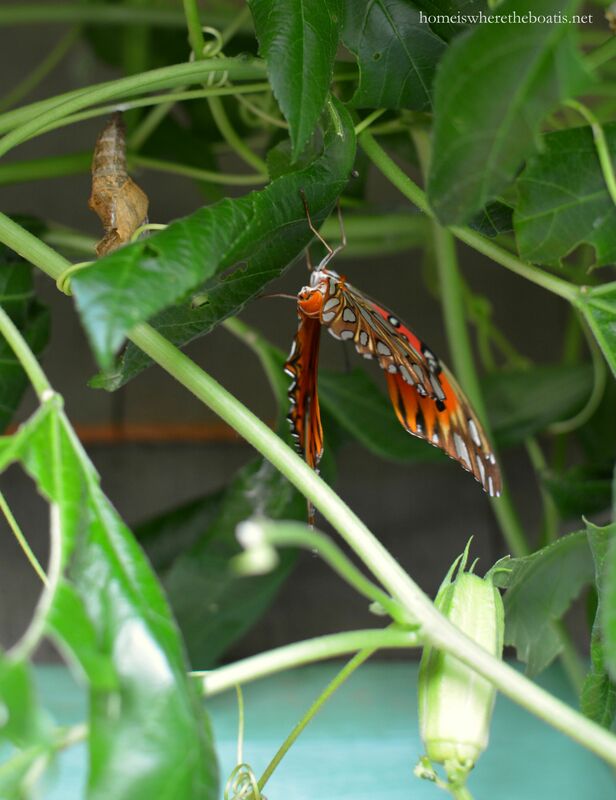 The chrysalis resembles a dead leaf and a butterfly emerges in about two weeks, hanging upside down until the wings expand and are ready for flight! They are beauties! Thanks for sharing! Just so informative. Beautiful pictures. Thanks for teaching, teacher. 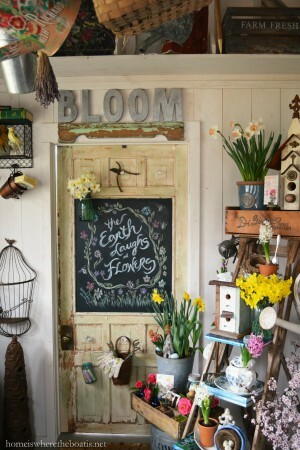 Beautiful as always, Thanks for your lovely blog. OMGoodness, they are beautiful! I was amazed when I saw how they stripped all the leaves from your vine!!!! But, like you said, a small price to pay to see their beauty. Thanks so much for sharing this, Mary. Have a beautiful weekend! I share my parsley with the monarchs, and also the dill. 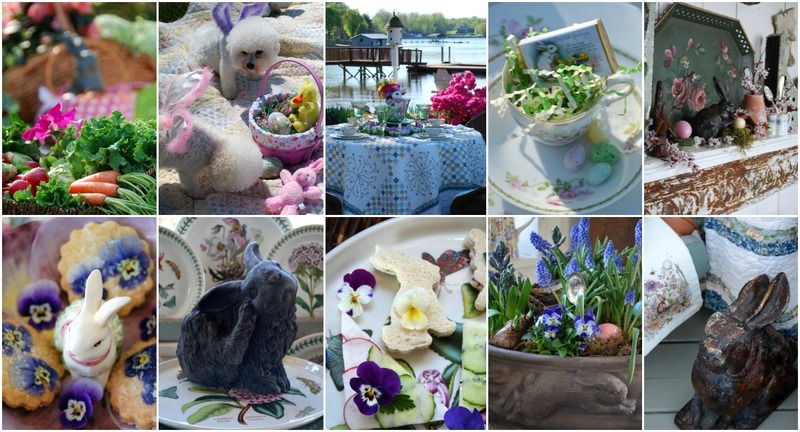 Mary, thanks so much for the lovely photographs, and all the great information! 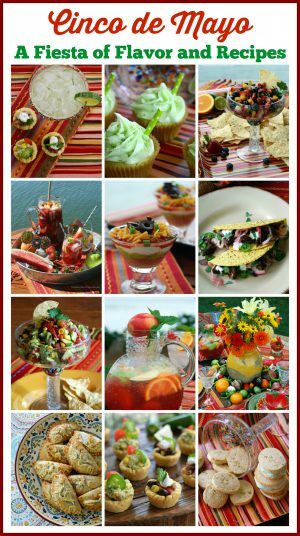 A wonderful blog! Wow Mary, isn’t that something how the Passion flower vine was stripped so quickly? It was all worth it to see the beauty that resulted, wasn’t it? Your photos are just gorgeous and I thank you for the beauty this morning! You must have a spectacular camera to get such wonderful photos! That plus an eye for composition makes for such beauty to behold. 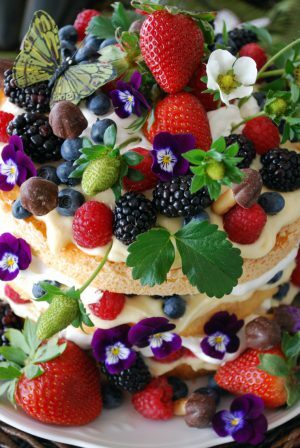 A feast for the butterflies and a feast for our eyes. 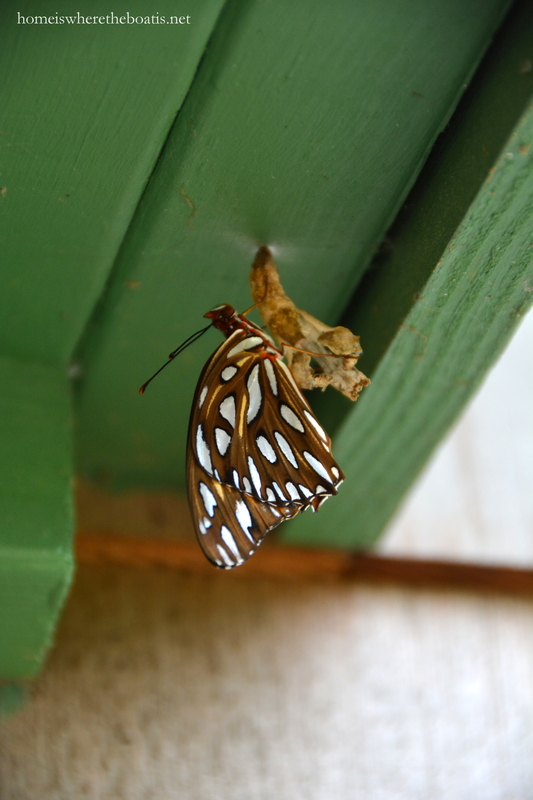 What absolutely stunning photos of the cycle of life for these butterfly beauties. Thank you for your perseverance in documenting God’s amazing creation! I hope that you have framed some of your photographs. I don’t know of anything that could be more beautiful!! 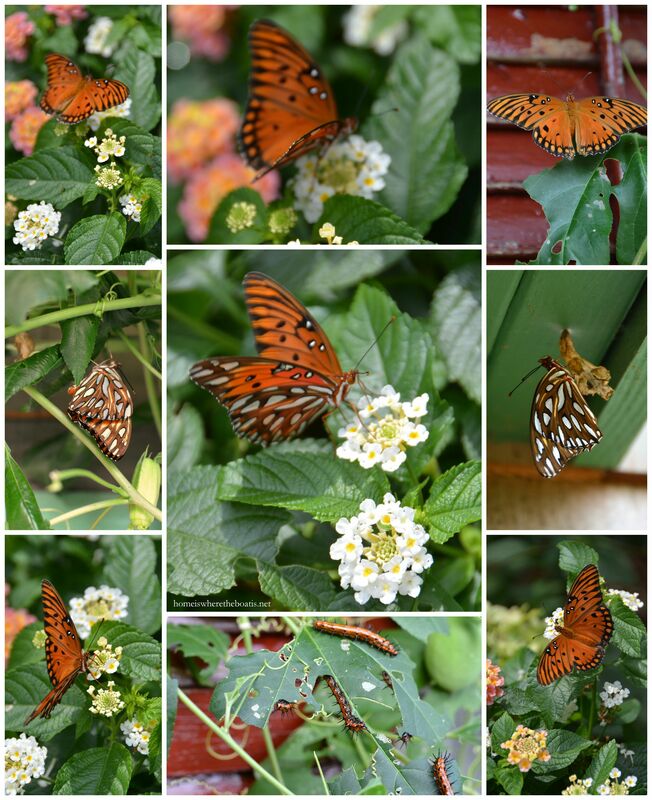 Beautiful pictures and the Butterfly’s are so pretty. Thanks so much for sharing. I’m wilted from the summer heat too! Oh my goodness, how beautiful! 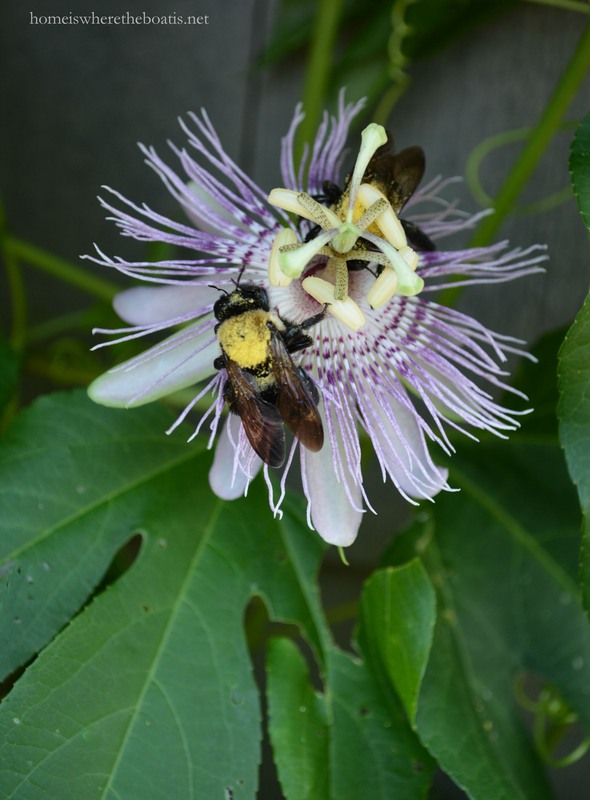 I would have been so sad about losing all the leaves on the passion flower though. I’m ready for autumn! I think the heat is leaving after this weekend. Gorgeous photos thank you for sharing! What type of camera and lense do you use? How interesting is nature’s beauty; thank you for sharing it with us. 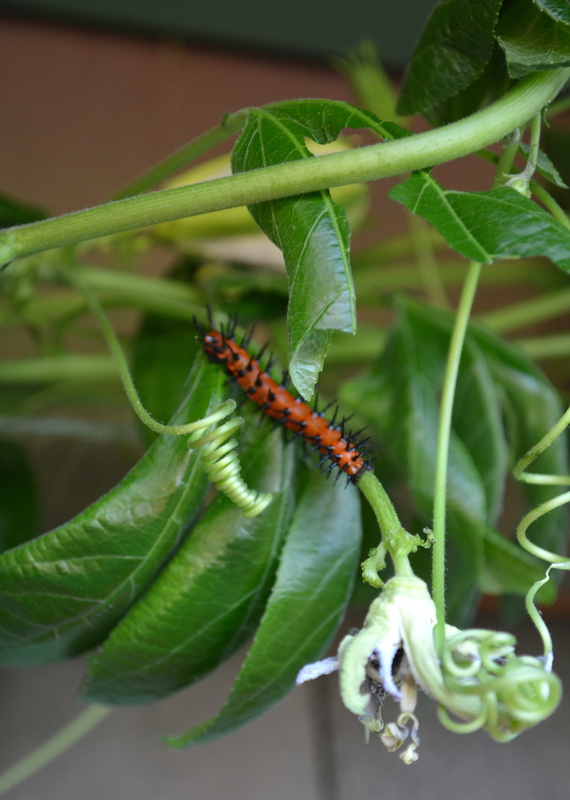 I had no idea about those wonder creatures, the caterpillars had a love for the Passion Flower Vines. What a beautiful circle of life you captured! What amazing photographs you have taken. Thank you for sharing. This weekend is the last weekend of summer and tomorrow’s temperatures will be close to 90 here. Enjoy your weekend. My husband and I are getting together with friends of many years whom we haven’t seen in awhile so looking forward to it. I really am speechless Mary, what you’ve captured and shared is simply incredible! 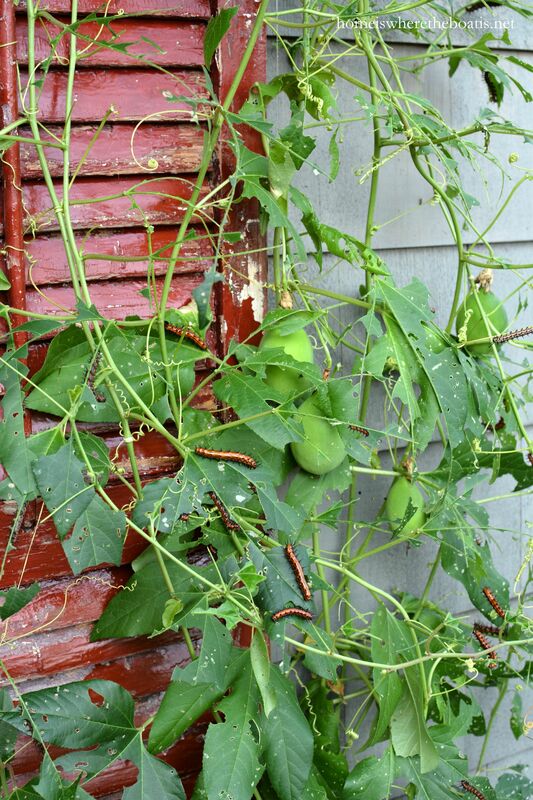 How it must have nudged your heart watching those caterpillars devour your beautiful vine~ but the acquaintance of these butterflies is definitely worth it!! Wow! Boy, oh boy! 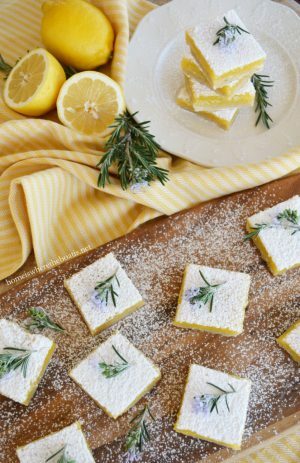 You’ve done it again, Mary! Simply amazed & made our eyes just dance over the screen taking in all lovely photos! 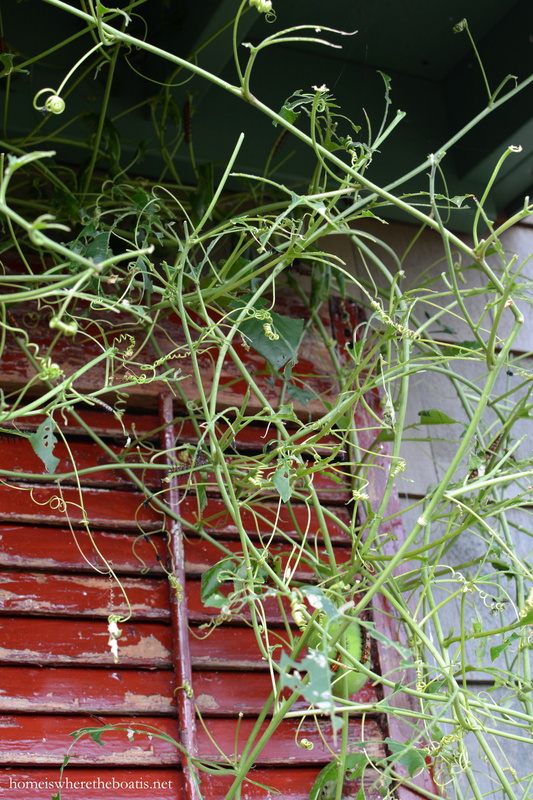 Well, mostly lovely…the poor vine! 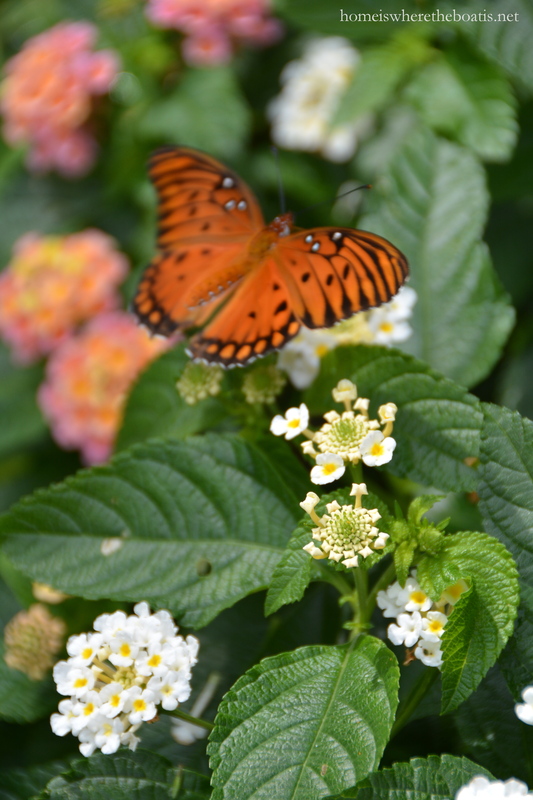 As I studied the butterflies, I heard myself saying “Oh!” various times. Thank you, Mary. You sure are a good sport! Breathtaking photography, Mary! A lovely subject and an appreciative photographer: The perfect combination! 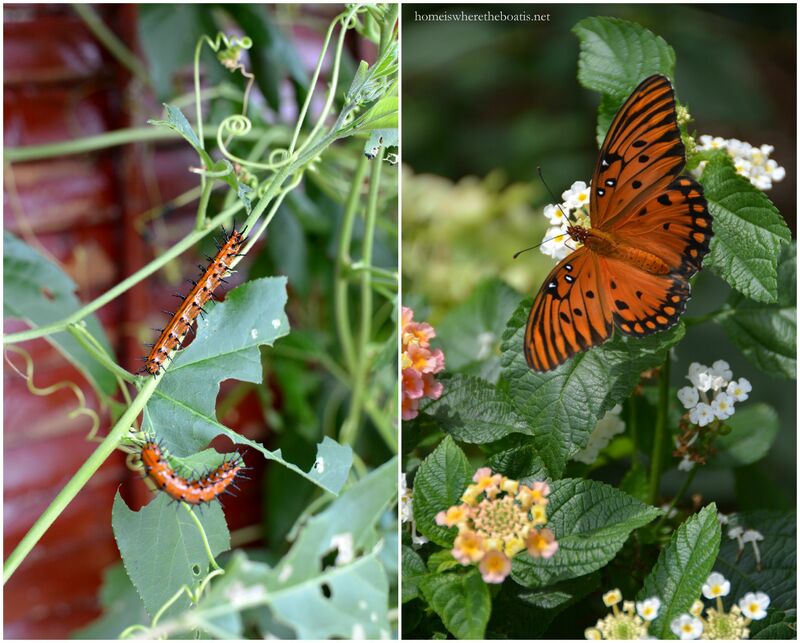 How delightful to capture the gulf fritillary in the various stages!. Amazing photos! I experienced the devastation of a dill plant years ago and I wasn’t as kind as you nor was I very smart. Since then, I have learned so much about butterflies but just a drop in the bucket. 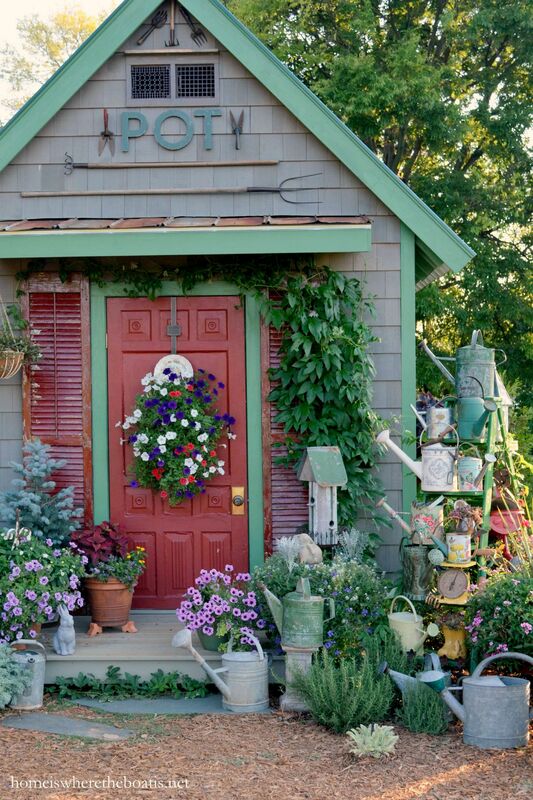 Love your watering can collection. Wonderful post and the teaching value to your followers. 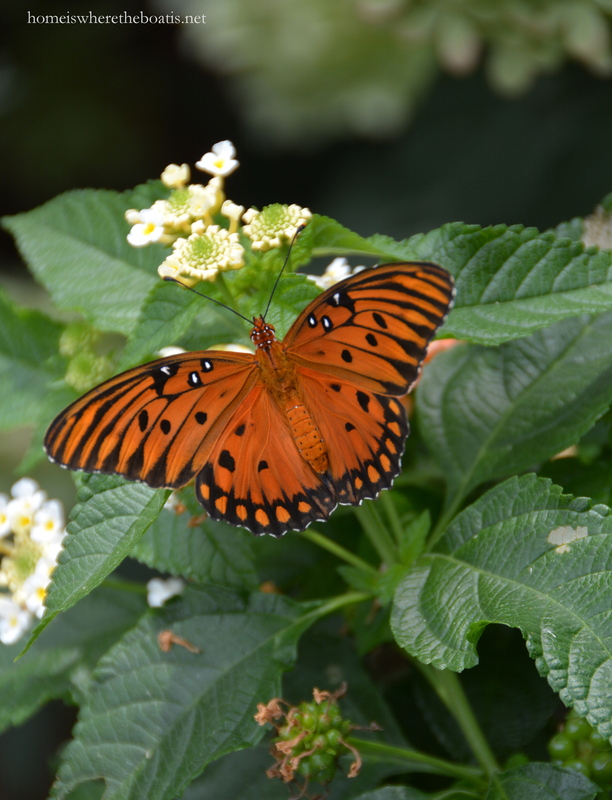 I had them in my San Diego garden along with Monarchs. 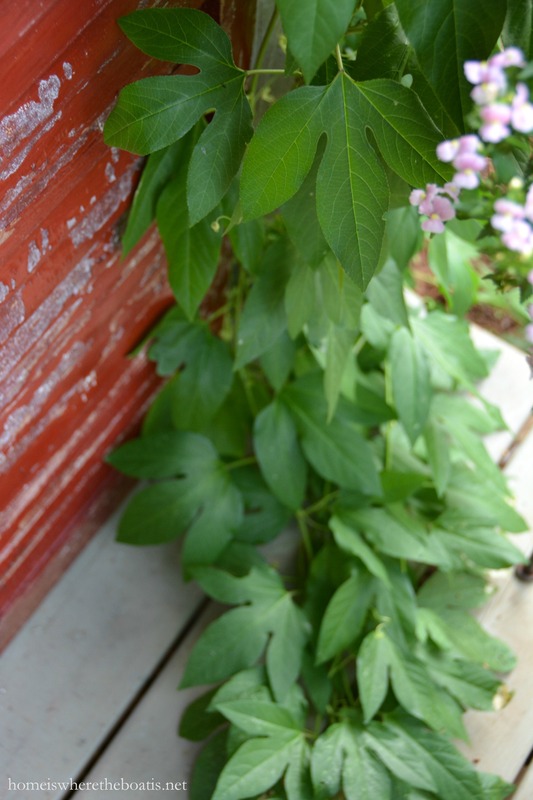 While they do strip the vine it bounces right back to be part of the cycle again….all is not lost. 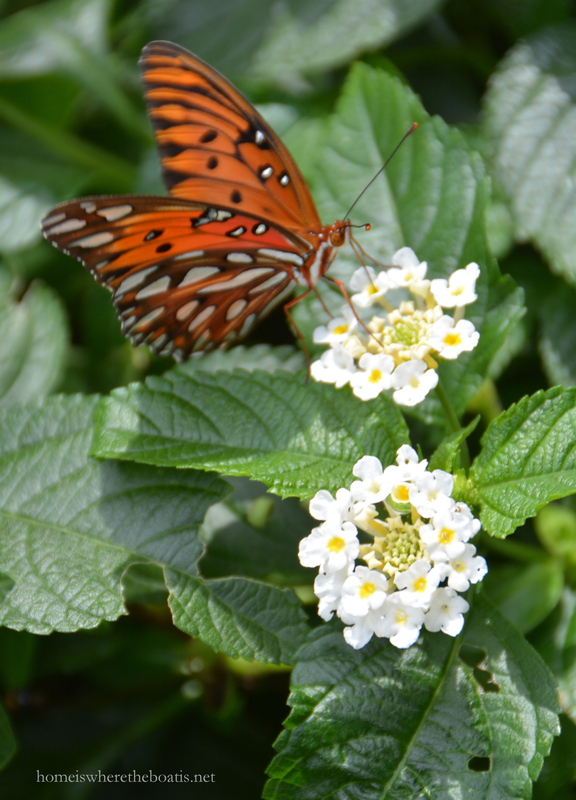 The foliage (host plant) has to be ready for the next round of egg laying by the butterflies. 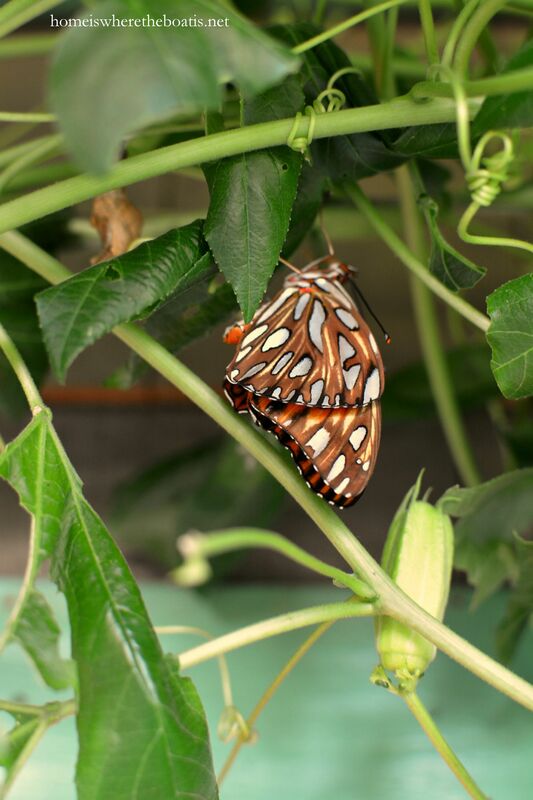 Wow Mary..you captured the most gorgeous photographs of the butterflies and the caterpillars….i used to have a passion flower vine in Florida…but never thought they would live this way….will have to find one…I love them. Wow, first hand experience is the best teacher! Now, that I’m older I am forgetting things. 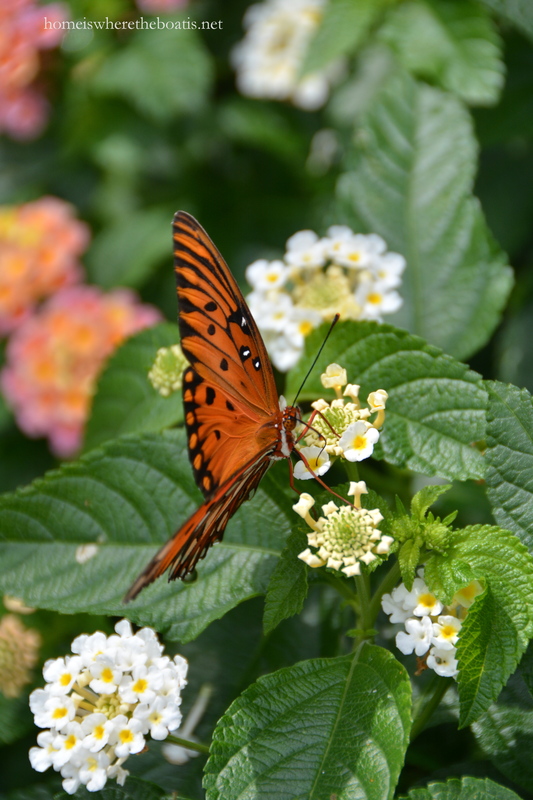 I read this in 2015 but didn’t retain all the information about the passion flower being the host plant for gulf fritillary butterflies. 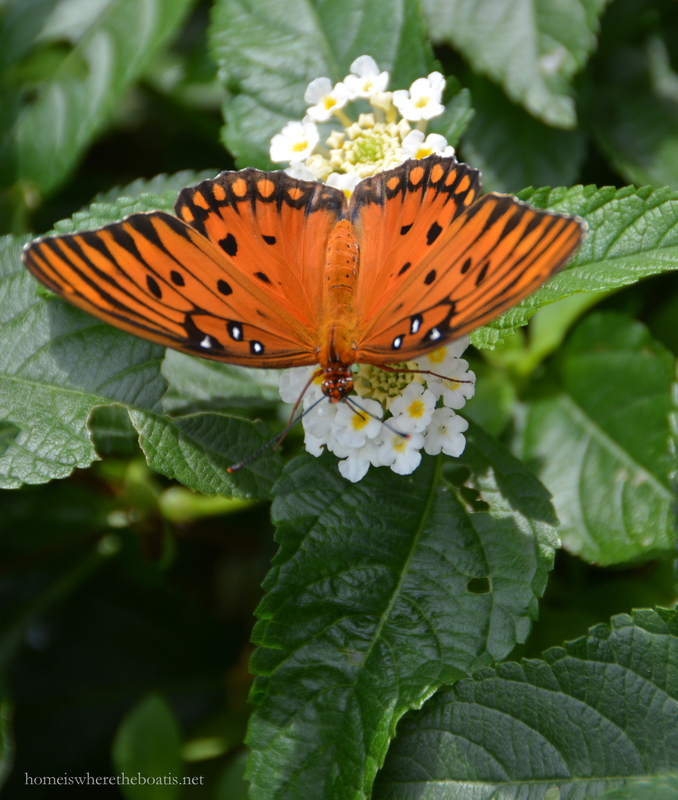 Now, that I have learned the stages and am better at identifying various butterfly species I am retaining all I have read more. You captured wonderful pictures. 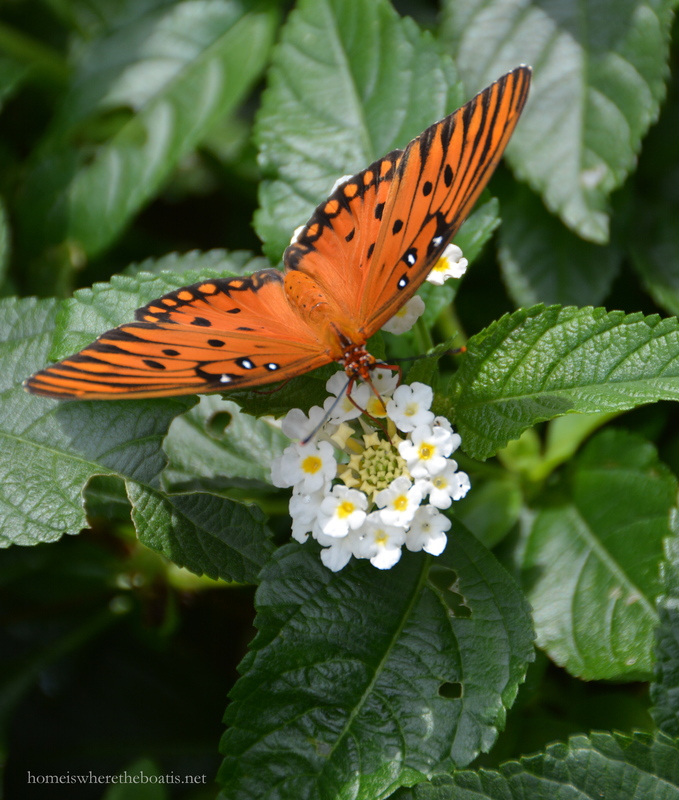 I have become so interested in butterflies. Great post with many faucets to learn from.